Dear readers, I have been active with other priorities and not blogged much. Now that I’m busier, I’ll probably blog more. I hope you enjoy the new blog page style. I updated my June post on Sri Lanka and added a lot of photos. I enjoyed my recent trips to Sri Lanka and the United Kingdom. 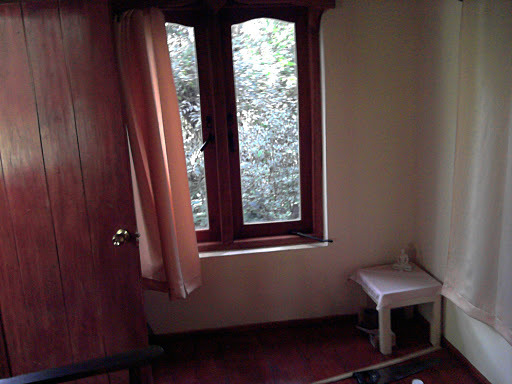 On the first trip to Sri Lanka (3.5 weeks in June 2011) I stayed with Bhante Nyanatusita at the Forest Hermitage where I installed mosquito screens, door handles, and tidied up a storage area. Bhante and I also went on a 5 day tour of places north of Kandy. We hiked in forests and climbed hills. I really enjoyed visiting ancient monasteries at Ritigala and Kaluda Pokuna as well as several significant sites at Anuradhapura. I learned a lot from close association with Bhante and our Dhamma discussions. 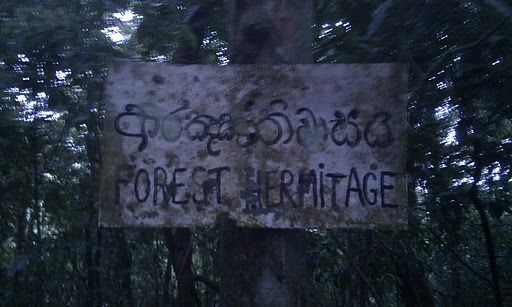 The second trip was only about 10 days and again mostly in Kandy working at the Forest Hermitage. Bhante and I installed a wifi antenna with lightning protection on the roof and significantly improved Bhante’s Internet connection. 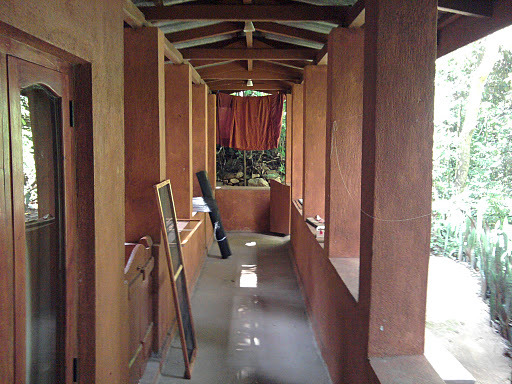 Michael made two mosquito screens with scrap wood and left over mesh at the Forest Hermitage in June 2011. 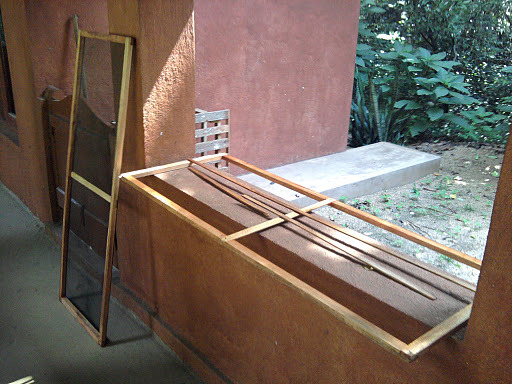 These two screens were installed in the window frames of the outside kuti sometimes used by guest monks. 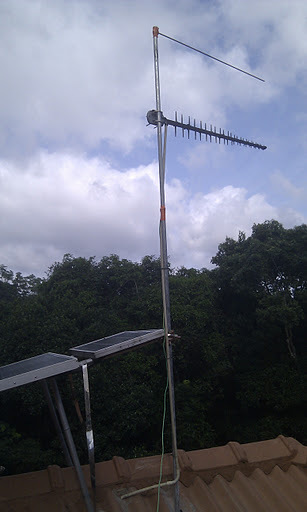 Wifi antenna installed on the Forest Hermitage roof, 13 August 2011. 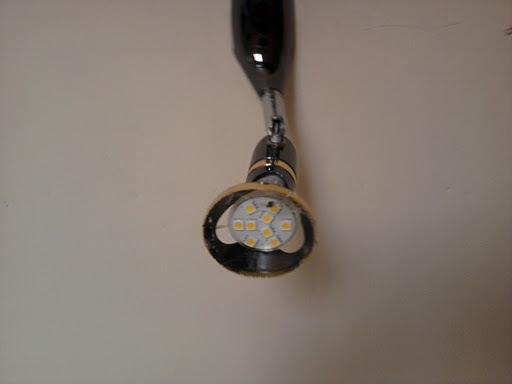 It is not quite finished. After this photo we attached three metal pipes connecting the antenna pole to the solar panel frame. These connections were insulated to prevent any lightning current flowing between them. The green wire in the photo is an earth wire that leads from the lightning attractor above the antenna itself down to a lightning rod embedded in the ground. You can see the white plastic pipe protecting the wire from the antenna and entering a small hole in the roof tile. My second trip (10 days in August 2011) coincided with the Australian cricket team’s tour of Sri Lanka which I had no interest in. It also coincided with the annual 10 day Perahera festival held in Kandy. I have little interest in colourful parades mainly because I don’t like mixing with crowds of people. I saw parts of the parade when I was in town shopping for items to install the wifi antenna. 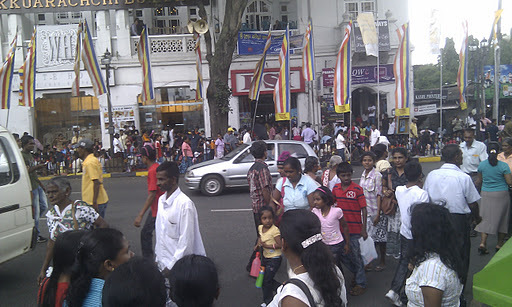 The parade is very popular among Sri Lankan people. Corner of Dalada Veediya and Yatinuvara Veediya, Kandy, Sri Lanka, 13 August 2011. People were sitting on plastic sheets on the pavements waiting for the Perahera festival parade so pedestians had to walk on the roads to get around. My trip to the United Kingdom was my first trip to the mother country since 1974. Except for my own two children, all other members of my Australian family (two parents and three siblings) had visited more recently and some have visited many times. I had a mild case of culture shock when I first arrived at Heathrow Airport and then spent my first week mostly in Wittering (near Chichester), Sussex. The weather was sunny and warm almost the whole time I was in the UK, even in Scotland. I then went to Telford in Shropshire; Edinburgh, Glasgow and Aberdeen in Scotland; and then Beverley, Hull and Polkington in Yorkshire. I visited most but not all of my UK relations. I was warmly welcomed by all and I learned a lot about family history. 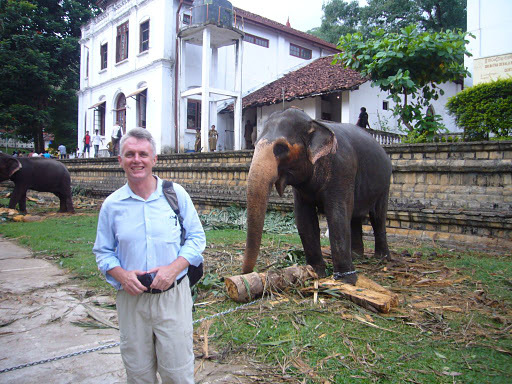 This trip to Sri Lanka and the United Kingdom was part of my exploration of ways to live a spiritual life as a lay man. I validated this approach and am very confident that this is the right thing for me to do it (not saying this is the right thing for everyone). In previous blog posts I wrote about getting stuck at the same point during Mahasi method vipassana meditation retreats. Since January 2010 I changed my primary meditation practice to samatha though I am still doing satipaathana (mindfulness of body, feelings, mind and dhamma; it has always been a combination of samatha and vipassana). Some might say that I have not tried hard enough. I am not keen on metaphorically bashing my head on a brick wall. I believe the path is gradual and gentle. I think the right amount of viriya-energy arises with the right amount of samaadhi-concentration. An imbalance in the faculties is an obstacle. On these two recent trips to Sri Lanka I kept precepts and offered items and service to the Sangha that stays at the Forest Hermitage.I also participated in Dhamma discussions with Bhante and others. I listened to and read Dhamma. Although positive and wholesome, these good deeds maybe less important or virtuous than bhavanaa-mental development through vipassana and samatha. However, the importance of developing samaadi.t.thi-Right View cannot be overstated. Dhamma discussion, hearing the Dhamma and asking pertient questions are all excellent ways of developing and supporting Samaadi.t.thi. 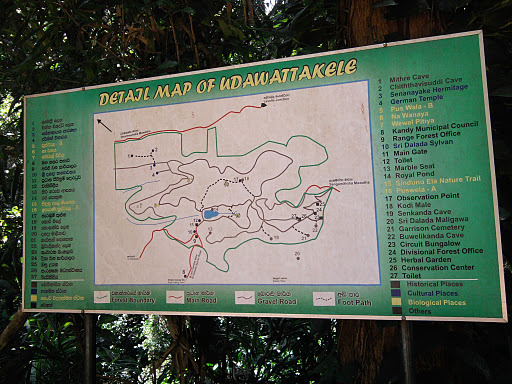 This entry was posted in Australia, donating, national parks, photo, Sri Lanka, United Kingdom, work. Bookmark the permalink. This was posted 2011. Are you currently blogging here. This is wonderful stuff! Hey Pablo, I sort of moved my blog from Blogspot/Blogger to WordPress but didnt’ follow through. I’ve posted a few more times to Blogspot. 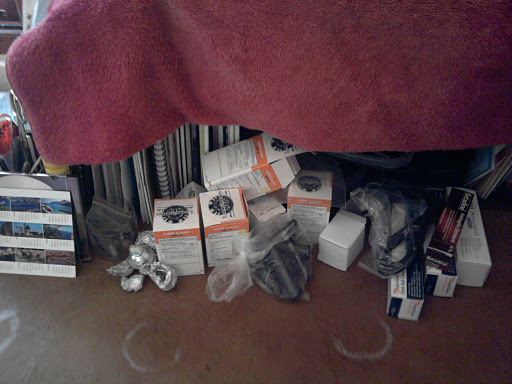 I really need to sort this out. I heard that WordPress is better. I will make more of an effort soon (heard that before…). I don’t agree that WordPress is better, but it is more community driven. Blogspot doesn’t give you the ability to connect with people of similar interests in the same way. Hope to hear more from you. I’ve seen your posts on Facebook and really want to read more.